We provide free no obligation in-home assessments! We provide quick and efficient service. 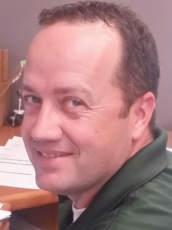 We have a certified lift specialist on staff who is trained with all of the latest technology and knowledge! 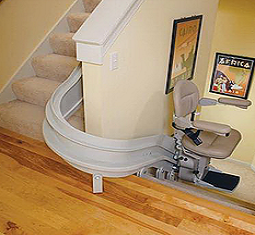 A stair lift is a motorized chair that travels along a rail mounted to the floor along your staircase. There are three types of stair lifts, straight, curved and outdoor. A straight stair lift is made to go up a straight stair case. A curved stair lift is made for stairs that have a landing and then another set of stairs, creating the curve as seen in the picture above. A ceiling lift is a motorized device that will lift and transfer a person from point A to point B on an overhead track that is mounted to the ceiling. 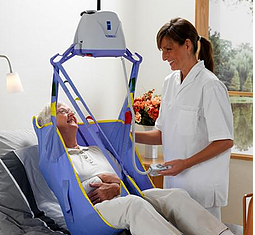 A ceiling lift moves up and down as well as right and left and can be operated by a caregiver or the patient can operate the lift themselves. Other elaborate lift systems available. A platform lift (also known as a porch or deck lift) is an elevating device that travels upwards from ground level. 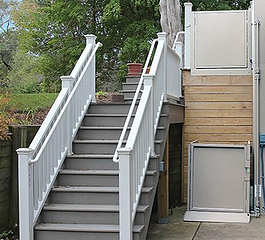 These lifts are typically used outdoors to allow access from ground level into the entrance of a home. Platform lifts feature an open platform and a drive mechanism to power the platform up and down. 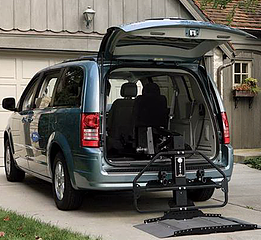 A vehicle lift is a motorized device that will lift a wheelchair or scooter into the back of a vehicle. They have a compact design that often maintains second row seating and are a one button operation.